Relationship not meeting your needs? Have you ever thought of ending a relationship that was not meeting your needs? Your relationships may not meet your needs. Counselors see a lot of anxious, depressed, unhappy people. Happiness seems to have some common features, but each person’s pain can come in a host of hues. One recurring theme is that this person is not getting their needs met in their relationships. By relationships, I am not thinking of strictly or exclusively of those primarily romantic and sexual relationships. Sometimes it is friendships that let people down, or it might be that relationship with family and friends. Your relationship with coworkers could be unsupportive or downright hostile. You look to others for emotional support, to get those social and emotional needs met and there is something lacking. Some of you have wounds from childhood. Parents who were neglectful or even abusive. Even parents who try really hard are not always successful at meeting their children’s needs. Parents who had their own wounds don’t have “it” to give. Some parents are too sick or stressed to attend to their children’s needs. You thought your partner could make you feel happy. Most people have unmet emotional needs. The quest to get your needs met is part of that American dream – the pursuit of happiness. People with large unmet needs rush into relationships faster than those who have most of their needs met. In the early stages of a relationship, you probably were getting your needs met. That other person had a genuine interest in you. If they did anything that made you feel good about yourself or about life, you could easily be convinced that you had finally found the key to a happy life. They probably thought the same thing. Then something went wrong. Early in romantic relationships, it is all about being together and sharing adventures, then things start to change. One or both of you had to work. Then the kids came along. For many couples, the children became a part of your life even before the two of you had the couplehood thing figured out. Your partner not meeting your needs, you focus on the children, or work, or whatever. If you have been disappointed in your primary relationship is easy to shift the focus to the kids. You try to give them everything you never had. You want your children to be better than you so they can have a better life. And then things may start to go wrong. One way to cope with a disappointing relationship is to work longer and harder. You might decide to be your child’s best friend and go everywhere with them. Others spend all their time rescuing sick friends, you know the kind I mean, the ones with daily drama. The harder you try to get your needs met by doing for others the harder you crash when, soon or later, you awake to realize that those other people are not meeting your emotional needs either. Feel like no one loves you or cares about you? The harder you push to get others to meet your needs the more likely you will be to have a gigantic collapse with the realization comes that these others are not and will not meet your emotional needs. No one will be able to care more about you than you do. Chasing others to feel good about yourself will leave you behind. The key to feeling loved is to love yourself. If you are emotionally healthy you can attract other healthy people into your life. That does not mean that two people with challenges can’t be happy together. They both need to work on themselves if they are to have the “what” to give each other. You may decide to change the people in your life. Unhappy people end their relationships. Children move out or run away from home. Friends stop talking to friends and many couples pick this moment to end the relationship. You may decide the only way to get your needs met is to find a new partner that can make you feel the way you felt a long time ago when you first fell in love. Friends made late in life rarely are as close as those made in childhood. Second relationships end more often and faster than first. Clearly, there are times when the relationship is unhealthy and you need to end it, but if you think that by changing people in your life you will automatically start getting those emotional needs met you are likely to be disappointed. The secret to getting those needs met? What many find after all their efforts to get others to meet their emotional needs is that the person most able to do that for you is – yourself. Learn to like, love, yourself. Easy to say and sometimes hard to do. If you think that your self-worth and your worthiness for love comes from others it takes an effort to shift that gaze and look inward. Become your own best friend. Do things that make you happy. Good self-care and doing for yourself is not being selfish. If you do not care for yourself others will never be able to do enough to meet those needs. 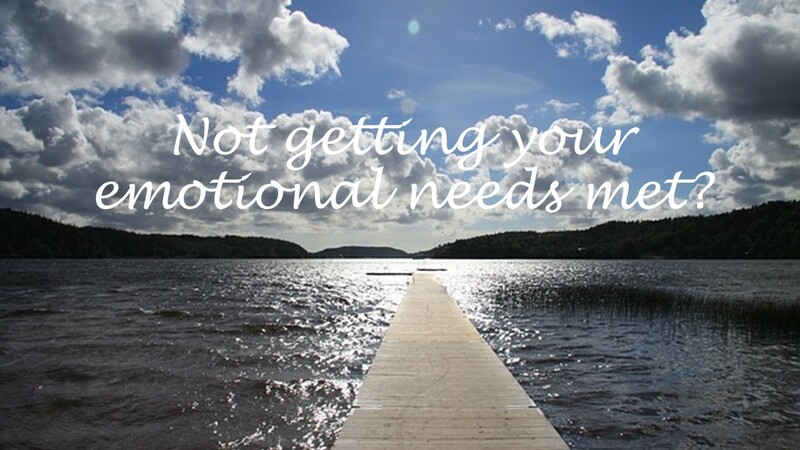 What are you doing to meet your emotional needs? This entry was posted in Relationships and tagged Emotional needs, feeling unloved, focus on children, no one cares about you, secret to getting needs met, someone to make you happy by David Joel Miller. Bookmark the permalink.